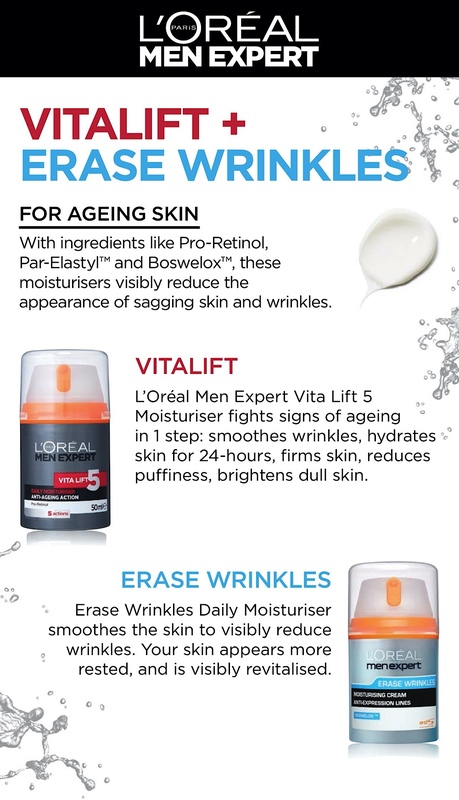 L'Oréal Men Expert Vita Lift 5 Moisturiser fights 5 signs of ageing in 1 step: smoothes wrinkles, hydrates skin for 24h, firms skin, reduces puffiness, brightens dull skin. Vita Lift 5 Moisturiser combines Pro-Retinol and Par-Elastyl, for a visible anti-ageing action. It helps fight sagging and visibly reduces the appearance of wrinkles. The formula is enriched with Pro-Retinol, a powerful anti-ageing active, and draining agents to help stimulate skin cell regeneration for a visible anti-ageing action. Skin looks firmer and feels revitalised. It fights 5 signs of ageing in 1 step: Smoothes wrinkles, hydrates skin for 24h, firms skin, reduces puffiness, brightens dull skin. Non greasy, non sticky easily absorbed. Tested Under Dermatological Control. Butyrospermum Parkii Butter / Shea Butter, Panax Ginseng Extract / Panax Ginseng Root Extract, C12-13 Pareth-23, C12-13 Pareth-3, Stearic Acid, Allantoin, Dimethiconol , Sodium Hydroxide , Divinyldimethicone/Dimethicone Copolymer, Cyclodextrin, Palmitic Acid, Aluminum Starch Octenylsuccinate, Mannitol, Theobroma Cacao Extract / Cocoa Extract, Disodium Succinate, Propylene Glycol, Capryloyl Salicylic Acid, Caprylyl Glycol, Trisodium Ethylenediamine Disuccinate, Xanthan Gum, Faex Extract / Yeast Extract, Acrylates Copolymer, Cetyl Alcohol, Butylene Glycol, Retinyl Palmitate, Pentaerythrityl Tetra-Di-T-Butyl Hydroxyhydrocinnamate, Phenoxyethanol, Linalool, Limonene, Parfum / Fragrance. (F.I.L. B160876/2). L'Oreal Men Expert Vita Lift 5 Moisturiser 50ml is rated 5.0 out of 5 by 2. Rated 5 out of 5 by jack001 from Really Works! Have been applying daily for past couple of months. My face feels smoother and looks fresher. Rated 5 out of 5 by Scotty001 from Great value I can’t say enough about this product. I spend most of my time outdoors and in harsh sun and wind, this product keeps my skin soft and moist, without it I would look ten years older.